Aj was teaching Stevie to do a "model face". Trav made him stop right when I took the pic. I know the picture is really blurry, but we were in the car and I was dying laughing. Stevie carries a "Man Bag" for his pacifiers, puts on makeup and once took a pink blanket to school. Now AJ is teaching him to model. He was loving it too!!! Trav not so much! Look an Bubba's eyes, he's like whats wrong?! A few months ago, I signed up on 2 blogs to Pay It Forward. Not really thinking much of it. The plan is for them to send out 3 handmade crafts to reciepients with in a year. Then in return I will send out 3 gifts and so on and so on. Well yesterday, I recieved my first Pay It Foward. 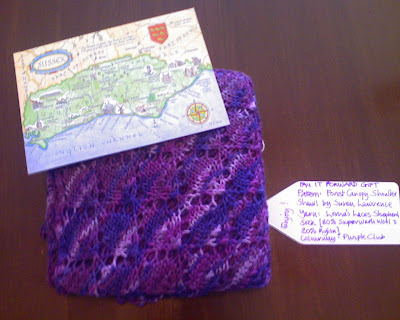 It is a beautiful shawl along with a very nice postcard from Miss Jan in England. Obviously the picture does not do any justice. First of all, I was surprised by the detail but then the fact it came from a stranger in England! How cool is that! I was probably suppose to let it be a surprise but who could wait!!! Im so utterly excited. I could just about scream! So I think I'm ready to start my Pay It Forward now. I have one person already, Miss Stephanie. 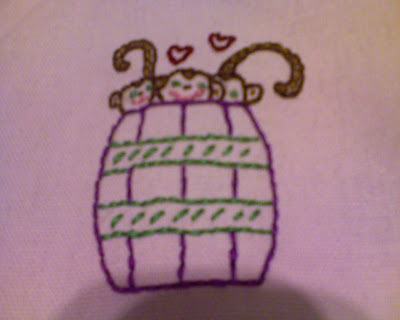 So the next 2 people that leave comments, will recieve a handmade item from me. I have not decided what it will be yet. The only catch is you have to promise to send something out to 3 others. So a couple days ago, Stevie started having junk in his eyes, not big deal. Well yesterday it got worse and today it is horrible. Usually when the kids are sick, I just bringing them too work. Its so bad, I couldn't even do that. I'm stuck at home wiping everything down over and over. This is why I'm not a SAHM. 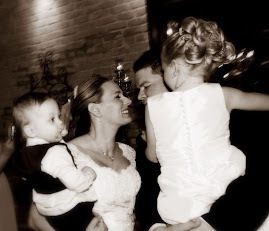 I envy my friend Amanda that does it with 3 kids but it is definitely not for me. I have laundry to put up, sewing to do and dishes to clean but I don't want to spread any germs around. Hopefully A.J. doesn't get it. When she gets pink-eye, it progresses into Styes. She has already had her eye lanced before and I do not want her to have to go through that again. I have wipes that Trav got me from the hospital that kill everything. So here I am running around with my strong wipes, cleaning with gloves and a bottle of Germ-X in my back pocket! Perfect candidate for OCD!! !